The best waffle recipe ever! Soft and fluffy inside, with a slightly crisp exterior. Easy to make & perfect for breakfast, brunch, or dessert! Waffles! My family loves ’em. How could they not? There’s something so wonderful about a stack of piping hot, golden brown waffles, fresh off the waffle maker. We mostly eat them for breakfast, but they’re REALLY good for dessert too. Waffles and ice cream is a total classic! I’m big on make ahead breakfasts for my kids. These chocolate chip muffins are a staple, and I’m a huge fan of scones too (check out these lemon blueberry scones, and these petite vanilla bean scones!). And I always try to keep a batch of these homemade waffles in our freezer too. In my opinion, this is the best waffle recipe ever! It’s easy to make and the waffles bake up perfect every time. The flavors are perfectly balanced (not too sweet!) and the texture is on point. Soft and fluffy in the middle, with a slightly crispy exterior. Waffles fall into the “quick bread” category of baking, which means they’re leavened with baking powder, and the method is super fast and super easy. With any kind of quick bread, you start by blending the dry ingredients, then the liquid ingredients, and then you stir everything together and bake it up. So, for this homemade waffle recipe, the dry ingredients are flour, sugar, baking powder, and salt. Just whisk them all together in a big bowl. Then, whisk together the buttermilk, melted butter, eggs, and vanilla. If you don’t have buttermilk, you can create a reasonable facsimile by adding a little lemon juice or white vinegar to regular milk. Let it stand for about 5 minutes, and it will start to curdle and become thicker. Stir the liquid mixture into the dry. Don’t overdo it, or your waffles could come out tough. It’s perfectly ok (and even preferable!) if the batter is a bit lumpy. 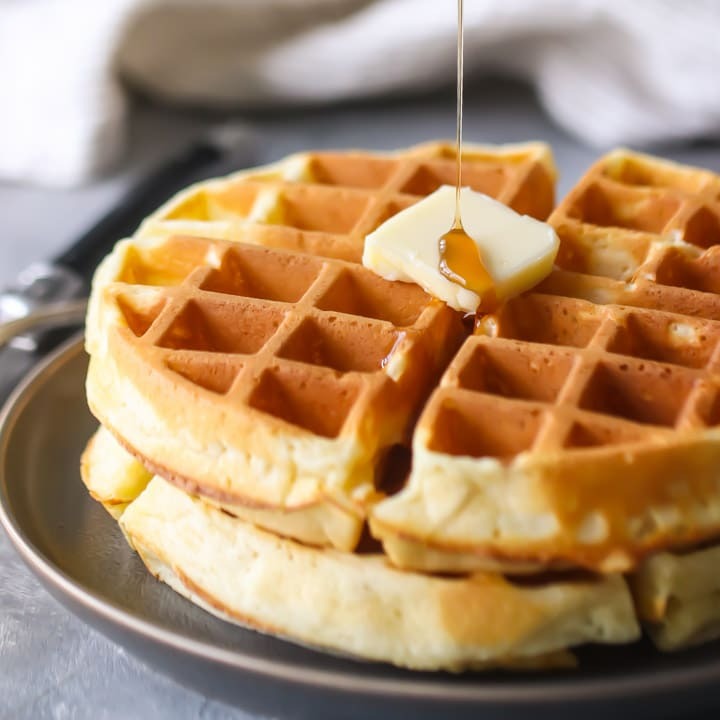 Just scoop the batter into your preheated waffle maker, and let it do it’s thing! You’ll know your waffles are done when they’re golden brown and a little crisp on the outside. This waffle recipe calls for all-purpose flour, but you could also use self-rising flour. If you do, just omit the baking powder and salt. For a dairy-free option, use any plant based milk, along with your favorite vegan butter substitute. Waffles are so versatile! They can be topped in any number of different ways. My family loves to eat them with butter and maple syrup. I think that is probably the most traditional way to enjoy waffles. But they’re also great with fresh fruit or berries, and a dusting of powdered sugar! We also like to top them with peanut butter, almond butter, or Nutella. And they’re really good with fried chicken! It’s a thing, trust me. A very delicious thing. Drizzle with chocolate syrup, hot fudge, or caramel sauce for the waffle sundae of your dreams! CAN HOMEMADE WAFFLES BE FROZEN? 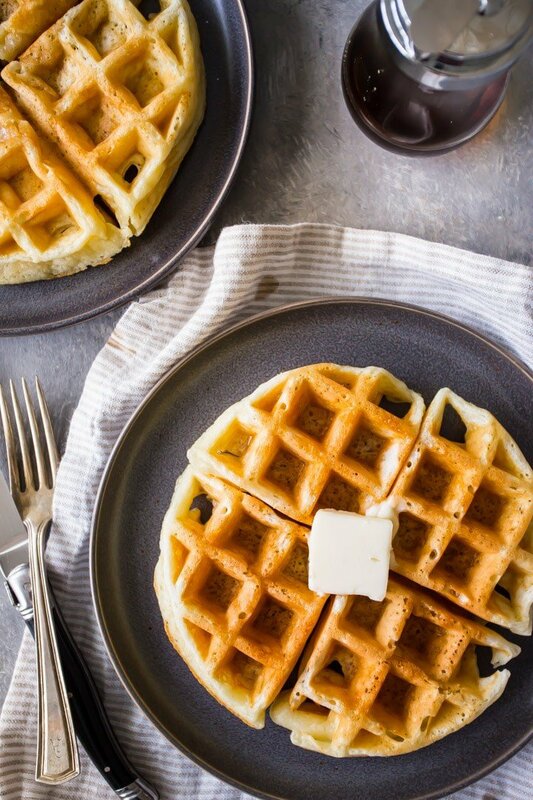 Make a big batch of these homemade waffles, and keep them in your freezer! They freeze beautifully, and make busy mornings so much easier. It’s so great to be able to serve a homemade breakfast to your family, with minimal effort! As the waffles come out of the waffle maker, cool them on a wire rack. Freeze them (in a single layer) until hard, then slip them into a plastic bag and stash them for several weeks in the freezer. When you’re ready to serve, just reheat them gently in the toaster. 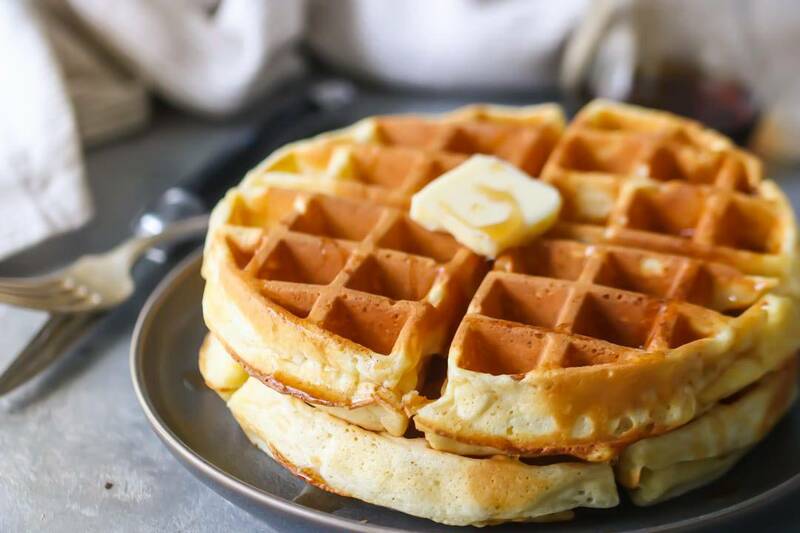 I hope you’ll give this homemade waffle recipe a try! I bet your family will love it just as much as mine does! Place the flour, sugar, baking powder, and salt in a large bowl, and whisk to combine. Place the buttermilk, melted butter, eggs, and vanilla in smaller bowl, and whisk to combine. Pour the liquid ingredients into the dry, and fold together until mostly blended but still a little lumpy. Place about 1 cup of waffle batter into the hot waffle maker and cook until golden brown (about 2 to 3 minutes). *If you don’t have buttermilk, you can substitute by stirring 3 tablespoons of lemon juice or white vinegar into 3 cups of regular milk. Allow the mixture to stand for 5 minutes, or until thickened and slightly curdled. Definitely a breakfast favorite! These are perfection! I’ve finally weaned my hubby off Bisquick pancakes! Next up, waffles! Your recipe is perfect. I’ve finally weaned my husband off Bisquick pancakes. Next is waffles using your wonderful recipe. this is the perfect waffle! Excellent recipe. I didn’t have enough buttermilk (shy 1 cup) but I topped it off with cream and milk and it still worked great. That’s great to hear! Thanks so much for the positive feedback! Yes! It’s noted in the recipe card. Six 8-inch diameter waffles. My kiddos usually eat no more than half a waffle (so 2 “triangles”). Hope that’s helpful, Anna! 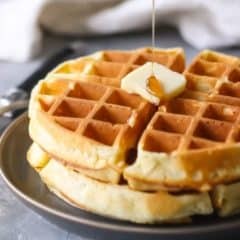 Can someone tell me the consistency of these waffles? My husband likes crunchy on the outside and slightly towards inside and then fluffy? Hey Alex! I actually described the texture about halfway through the post: “The flavors are perfectly balanced (not too sweet!) and the texture is on point. Soft and fluffy in the middle, with a slightly crispy exterior.” Hope that’s what you’re looking for! Thank you! Hope you love these as much as we do! 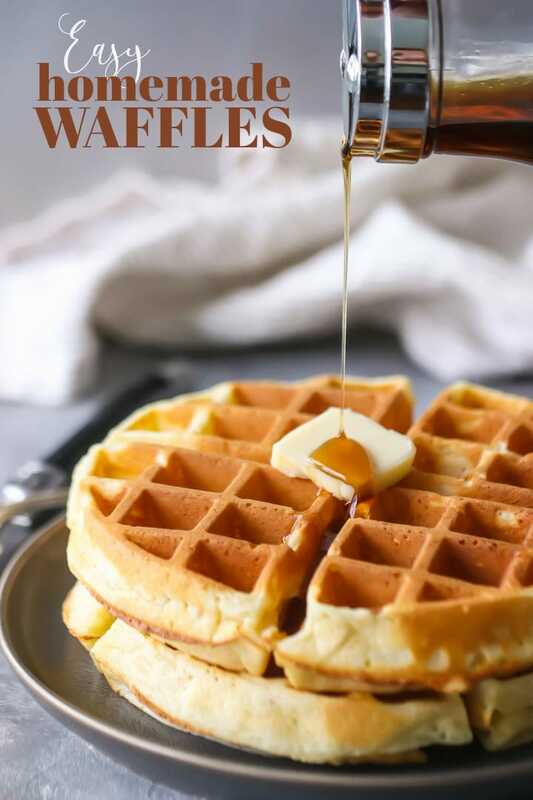 I am going to try these today as it is National Waffle Day. However, I only have salted butter. Should I just omit the Kosher salt? Thanks in advance for your reply. Hey Sandy! I’m so happy you’re going to give this recipe a try! It’s tough to know exactly how much to decrease the salt because different brands of butter have different levels of saltiness. I’d try omitting the salt at first, then give it a taste & see how you like it. You can always add in a little if you feel like it needs it. Hope that’s helpful! Enjoy! Thank you!, Allie. I didn’t make any waffles today. I WILL make your recipe this weekend. I will take your advice and give you my results. Sounds great! I’ll look forward to it! That’s so great to hear Sandy! I’m so happy you and your husband enjoyed. Thank you for the positive feedback! So happy you enjoyed Linda! The amounts are listed in the recipe card at the bottom of the post. Thanks for the feedback! Excellent recipe . I don’t like the newer recipes that are too sweet . This was perfect ! Thank you for sharing ! So happy you liked it Jane! I always prefer things that are just sweet enough. Thank you so much for the positive feedback! I’m glad i found this recipe from you! I bought my first waffle maker last week and i’m dieing to try it out. Unfortunatelly i broke 2 ribs on my right side last weekend and i’m not allowed by doctors’s orders to do anything in my kitchen. For at least 4 weeks! I’m not sure if i can keep my promisse to him that i won’t! Making waffles isn’t working in the kitchen in my opinion. Only i’ve to be a bit carefull not bumping in to something wich i do quit often. But i guess….next week or so? Then i’m making my waffles! So ….Thanks for your recipe, i’ll give it a go. Till next time. Oh and the turnovers….i really, really love those things! I’ll save that recipe as well. So sorry to hear that you’re under the weather, Marja! I wish you a speedy recovery so that you can get back to what you love doing. Good luck with the waffles and I hope you enjoy! How many ml is 1C? Hi Kim! 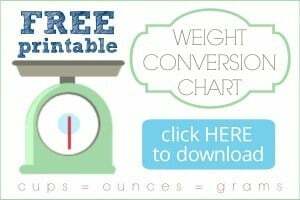 You can get all that info when you click the weight conversion icon in my right-hand sidebar. Here’s the direct link, in case you missed it: https://bakingamoment.com/weight-conversions-for-baking/. My family loves the waffles, it has become a weekly recipe. It’s great that it makes enough to have leftovers for breakfast during the week for my daughter. Aw, that makes me so happy Cathy! Thank you so much for your feedback. I’ve got to say that I was disappointed with this recipe. I couldn’t get these cooked just right. Most of them were too brown to the point of being black. Reducing the cooking time yielded an undercooked batter like center. The last batch came out best, after adding more flour to the mix and turning off the waffle iron halfway. The waffles ended up too crispy/crunchy on the outside and the crust was bubbly. A couple ideas that may have caused my issue might have been the excessive butter or vinegar or baking powder…or maybe a combination of these ingredients. I think I’ll just go back to my old standby basic recipe that came with my waffle iron recipe book. Hey Gary! So sorry you were disappointed. And I will look into that issue with the star ratings. I think it sounds like your waffle iron runs overly hot. If they’re too brown on the outside but still undercooked in the center, that’s a sure sign. And I would definitely recommend trying it with buttermilk if you can- the result you get with vinegar is ok but not quite as good to be honest! Thank you for the feedback! Wow Gary! I honestly don’t believe that you’re blaming the recipe for your what was most likely caused by your waffle iron! Even if it was due to one or more of the ingredients, you definitely didn’t have to comment so rudely! What works for one may not work for another…. I’ve read all the comments here and yours happens to be the only negative one. Good luck with your old basic recipe! VERY sorry Allie… (it’s probably not my place but…) This is the first time I’m on your site and about to use your recipe and I honestly got offended by this review! Lol thank you Lisa! I appreciate your standing up for me~! Hi Sheila! Did you happen to take a look at the video just above the recipe card? That should give you a good idea of what the batter should look like. Glad you enjoyed! I’m really pleased with how the waffles turned out. This recipe is easy to put together and the leftovers freeze well. I only had 2 cups of buttermilk, so in a pinch, rather than “making” it, I added 1 cup of cream. They were crazy good! That sounds amazing Conni! Thanks so much for the 5-star rating! Tried making the waffles again with a new waffle iron. My old waffle iron was failing and overheated the waffles, causing almost burnt sections on the waffles. My new iron is adjustable. I followed the recipe to a T, but they ended up “flat”. Adding more baking powder helped, but I should have added more flour too. I should have reread my initial assessment and adjusted the ingredients. Looking at the video, I see that my batter was clearly too runny in comparison. Maybe next time. Is the batter supposed to be runny? Mine was super runny after I made it. I think you can probably get a pretty good idea of what the batter is meant to look like if you watch the video. It’s embedded within the recipe card. Excellent recipe with excellent results just as described! Thank you! My pleasure Rose! So glad you were happy with it! That’s so great to hear! Thanks so much for the great feedback!